Crafted by 3B Scientific, these Mat Platform Tables were designed and built for use by physical therapists who stretch and exercise patients. Every element of the Mat Platform Tables was obsessed over to provide physiotherapists and other healthcare professionals with exceptional durability. The table is covered in heavy-gauge vinyl that prevents snagging and will readily withstand day-to-day use. Below the vinyl is 26 density foam that provides the firm support necessary for proper therapy. 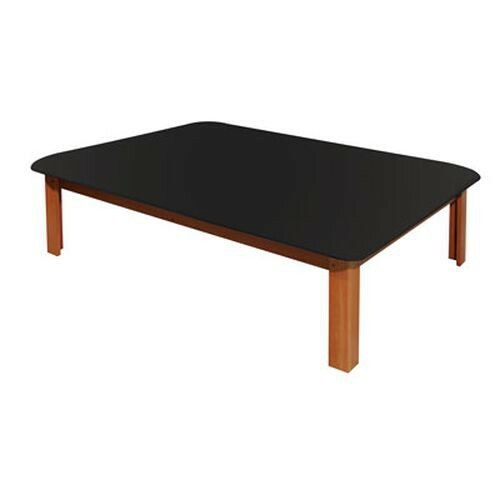 The Mat Platform Tables are available with black, dark blue or light blue vinyl upholstery. Enhancing the design are table legs that were made from ecologically friendly eucalyptus wood. The wood's natural warmth pairs smartly with the contrasting vinyl for a therapy table that integrates harmoniously into virtually any clinic, rehab facility or holistic health center. Vitality Medical also sells disinfectants to help keep therapy tables and clinics sanitary and pleasant between physiotherapy sessions. Clinic-ready: Easy-to-clean vinyl will hold up to years of treatment, and the 26 density foam will retain its solidity. Eco-friendly: Eucalyptus wood used for the table is Forest Stewardship Council certified, verifying that the wood was responsibly grown and harvested. Tip-top comfort: High-density, seamless foam mat top blends comfort and support.